My second batch of Halloween cupcakes, baked especially for October’s Cupcake Hero, uses dulce de leche, which I chose to make in the oven. Mine took about 1 hour, 15 minutes at 425°F. It didn’t turn very dark before the top of the dulce de leche started to turn a little hard and dark brown around the edges, even though I had it tightly covered with foil. I used an electric mixer to smooth out the lumps, but little tiny bits of the burnt edges remained. It didn’t affect the taste, though; it tastes great! These are delicious and super moist pumpkin cupcakes, filled with dulce de leche and frosted with dulce de leche buttercream. 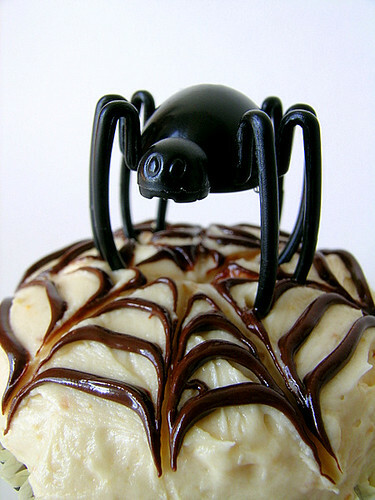 The web is made from melted semisweet chocolate and an awesome, creepy spider from Bake It Pretty adorns each cupcake. If you like these (and really, how could you not? 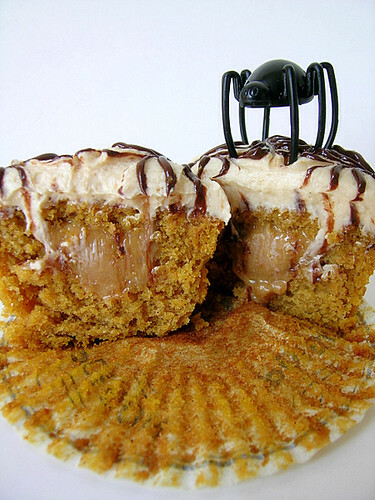 ), make sure to visit The Sweetest Kitchen for recipes for pumpkin cupcakes, dulce de leche, and dulce de leche buttercream! We'll wish this to you again on the holiday, but of course, Happy Halloween! And here's a link to all of Bake It Pretty's Halloween merchandise - there's lots of fun stuff there. Hi, congrat's for your blog! I absolutely love cupcakes, and have recently began making some myself. I prefer the ones that can be eaten!LOL! 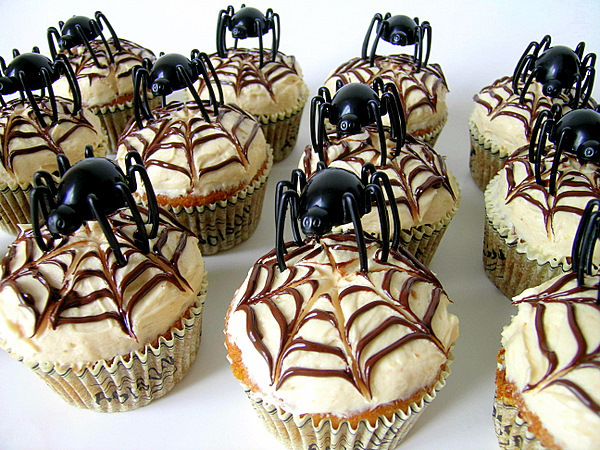 And these spider ones look horribly delicious!! Nhac! Oooooh, I HAD to bookmark this one! Thanks for sharing this! Thanks so much for mentioning Bake It Pretty! Those spider cupcakes certainly are amazing!